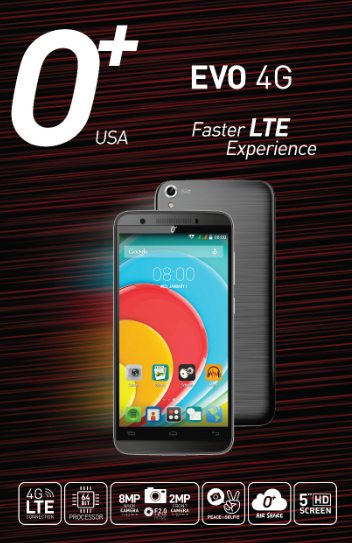 OPlus USA reveals a 5-inches android smartphone with 64bit Quad-core processor and it said to be the first 4G LTE device of the company, meet the new O+ Evo 4G. As mentioned, the O+ Evo 4G features 5-inches HD display with 720 x 1280 resolution and scratch resistant. It is powered by a 64Bit quad-core processor clocked at 1.4GHz with 1GB of RAM and 8GB internal storage that can expand using a microSD card upto 32 GB. With ₱7,995 price tag, the device comes with 8 megapixel auto focus main camera with LED flash and 2 megapixel on front. It also carrying 2500mAh Li-ion battery and support Air Shuffle, Peace to Selfie and Air Share cloud storage. Other specs include, dual sim/dual standby, Wi-Fi b/g/n, Bluetooth 4.0, Micro-USB, 3G, 4G/LTE with USB OTG support.